TIPS: The momentary push buttons used to create the keys of the piano are a little tricky at pushing into the breadboard. Carefully check the pins are straight and that they are in the correct position. With a little force push the buttons with two fingers either side of the push button. This is important because bent pins will not work. Why used a GPIO expansion cable, also know as a cobbler? To avoid damage to the RPi GPIO pins. If they get break/bent or are they are incorrectly connected this could permanently damage your RPi. Why is it called a cobbler – The reason being is that Adafruit develop this PCB and cable to enable access to the GPIO pins without frying your RPi. Why is called cobbler: Because it is a nice pun: Cobble means to hack something together, and cobbler is a dessert similar to pie. In order for the push buttons to play a sound we need to install some code libraries so that the RPi knows that we have pressed a certain. Then we can program/ code the button to play a certain sound. The are many languages that we could use to make our keyboard plays sounds. For this project we are going to use Scratch with a GPIO library. GPIO Scratch | You may be working with a RPi that has all the libraries installed. 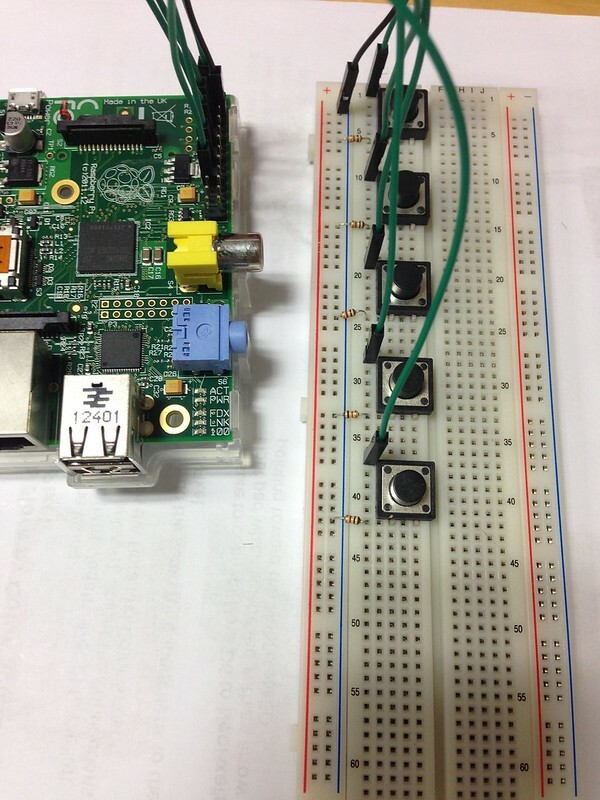 On the desktop of the RPi you will ScratchGPIO. If not follow the instructions below. The ScratchGPIOplus icon is for using with specific add-on boards like the pibrella. The following instructions will create a new Scratch icon on the desktop with ScratchGPIO written underneath the scratch cat icon. Terminal window and run it to download the installer. Or type the command. Only use the development version if you are confident with using BETA versions of software. Without using GPIO expansion cable. 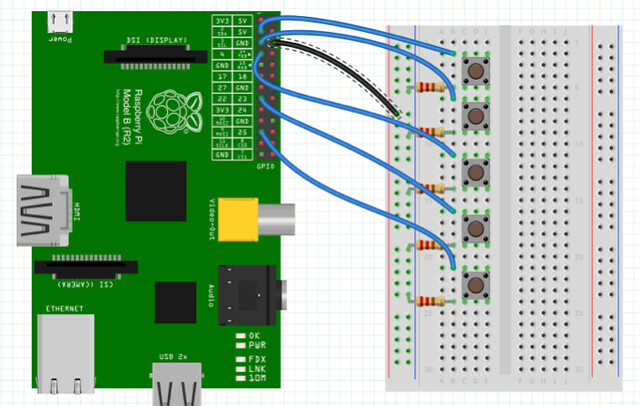 connect the jumper cable from the push button to one of the GPIO pins on the Rpi. Note that not all the pins are available in this version of Scratch GPIO. To check which ones are available open scratchGPIO and use the drop on the code block to show the pins numbers available. This is the pin location not the pin name. Test each button with a simple sound effect. This enables you to check that your button is working. You can record your own sounds for example – Halloween sound effects to a game that you have create or Music mixing. Use more buttons to create your own working games controller.